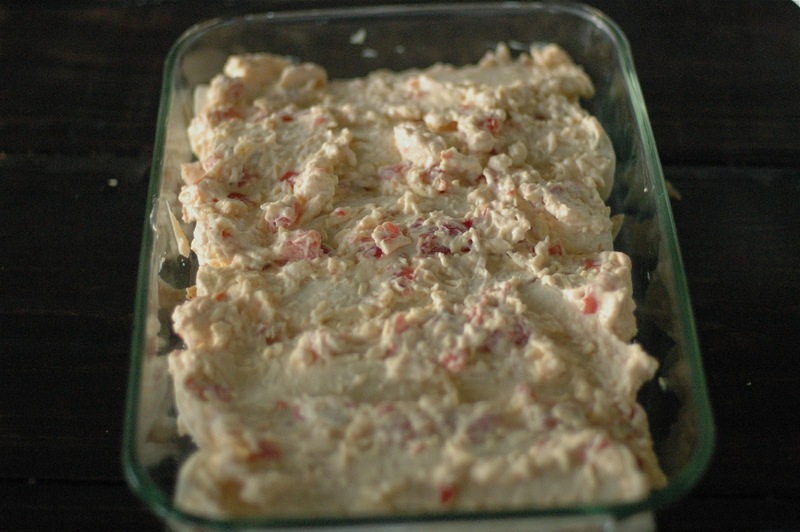 Dave has been hounding me to post about Sour Cream Chicken Enchiladas for some time now. It is one of his very favorite main dishes. The first time we had this was with our friends the Sadlers. They made it for us when we came over for dinner one night when we were newly married. It is a keeper. I like it a lot, but I must say that men love this dish the most. In fact, I once had a friend tell me (after I took a meal to their family when they had a baby) that he would have another child to get to have this meal brought to his house again. I told him this was extreme, and that a new baby is not a prerequisite for me to make this meal. That being said, I think it is a good main dish to take to friends who have a new baby (or other meal-bringing occasions). 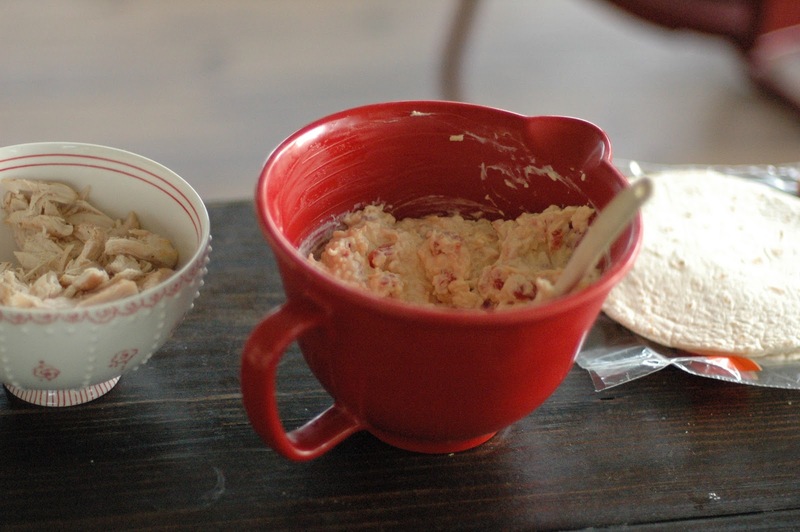 I usually make a batch of homemade salsa, and some yummy dessert and have a fiesta-on-the-go! 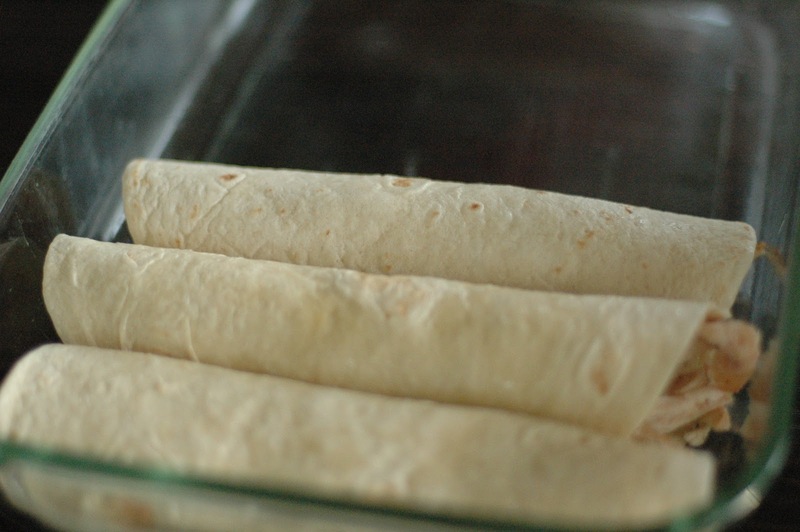 The recipe is called Enchiladas… though I think of enchiladas as being corn tortillas and these are flour. But maybe the “enchilda-ness” is the sauce that covers them. (That’s just an internal conflict I’ve had about this dish.) There are much more sophisticated enchilada recipes out there that you might choose, but this one is simple goodness. However, you can use this recipe as a foundation and tweak as you like. You can spice it up, if you like spicy, by adding peppers, hot sauce or spicy Rotel. You can top with salsa verde, if you love verde. Sprinkle with cilantro, or squeeze a lime on it, and get gourmet! You can grill veggies to add inside or even beans. I know, I’m getting wild here! I used to boil the chicken for the recipe, but a few years ago I started roasting it, thanks to Ina Garten teaching me about the glory of roasted chicken breasts. It is so easy and so much more flavorful. For this recipe, I baste chicken breasts with olive oil, and sprinkle with kosher salt, ground pepper and ground cumin. 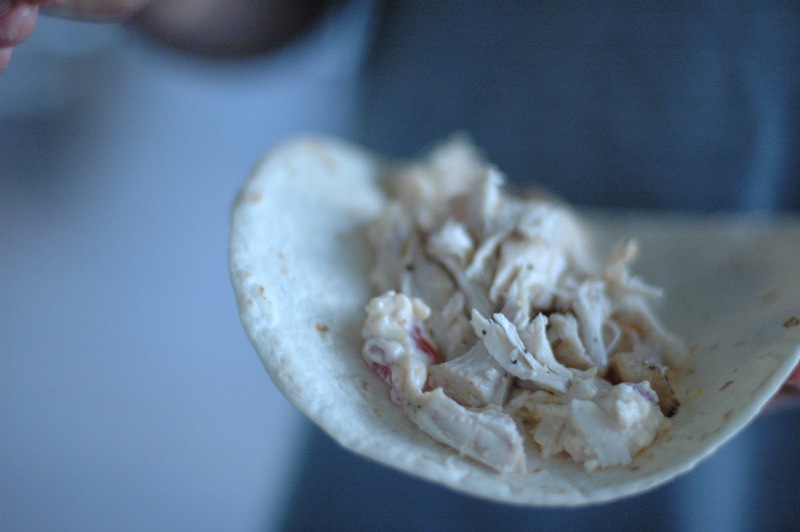 If you are tight on time, you can use a Rotisserie Chicken OR if’s the week after Thanksgiving, and you have a surplus of turkey, you can use it! Pat chicken breasts with paper towel. Coat lightly with olive oil. Sprinkle with a little salt, pepper and cumin. Bake at 375˚ until fully cooked. Tear into bite sized pieces. Put cream of chicken soup, most of the cheese, Rotel and sour cream into a bowl, microwave for a couple of minutes to warm together. Spray glass baking dish with cooking spray. 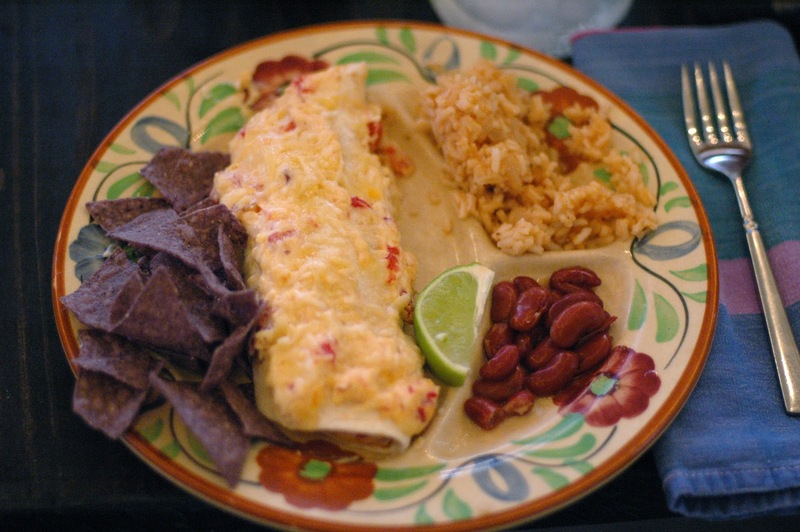 Assemble enchiladas by smearing on some filling, a sprinkle of chicken and then rolling up. Place seam side-down in the baking dish. Continue until you have used up all of your chicken. MAKE SURE YOU RESERVE SOME OF THE FILLING FOR THE TOP! (I made the mistake once of using it all up on the inside). Pour left over sauce over enchiladas and top with the little reserved cheese. Bake at 250˚ for 20-30 minutes until warm and bubbly. 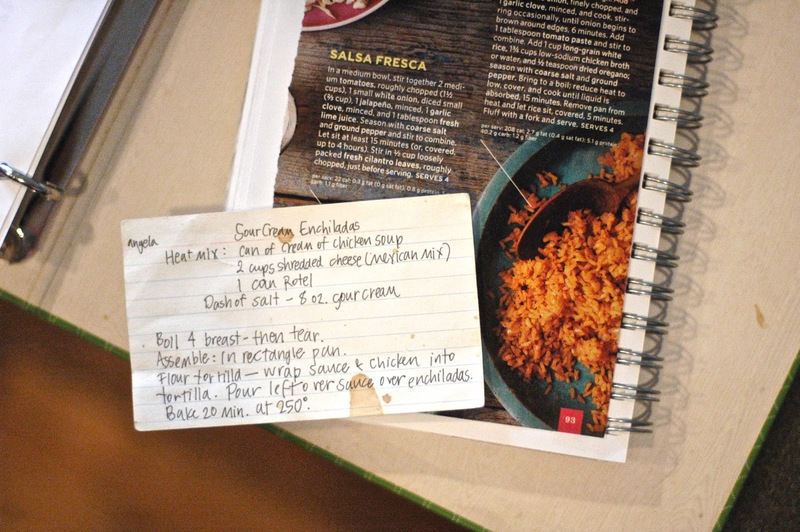 This Red Rice is my favorite choice for savory rice to serve with Mexican food. I have tried many of the boxed rices labeled “Mexican Rice” or “Spanish Rice”, but am usually disappointed. This was in Everyday Food magazine a couple of years ago and has been a favorite ever since. It only requires a few ingredients and is a tasty addition to a meal. In medium saucepan, heat oil over medium-high heat. 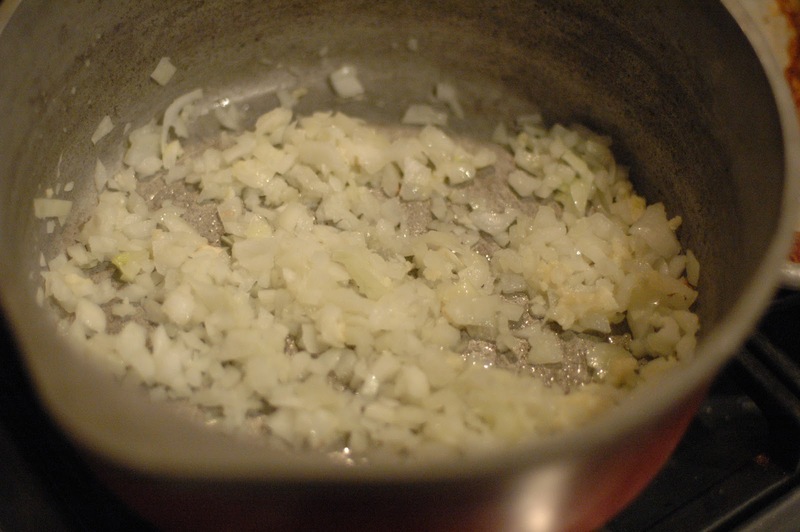 Add onion and garlic, stirring occasionally, until onion begins to brown around edges, 6 minutes. Add tomato paste and stir to combine. Add rice, broth (or water), oregano, salt and pepper (to taste). 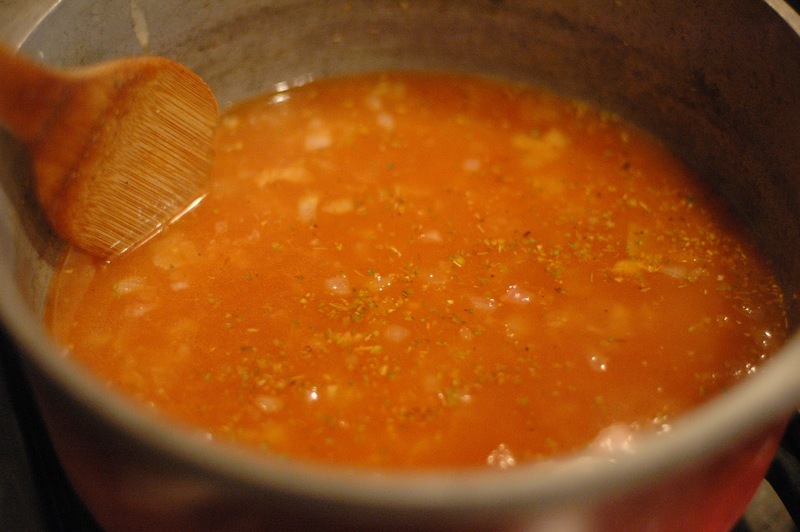 Bring to a boil; reduce heat to low, cover and cook until liquid is absorbed, 15 minutes. 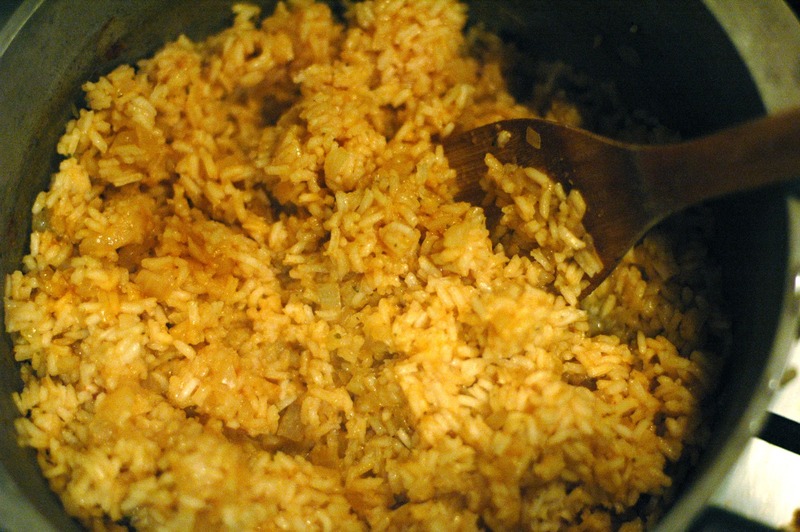 Remove pan from heat and let rice sit, covered, 5 minutes. Fluff with a fork and serve.